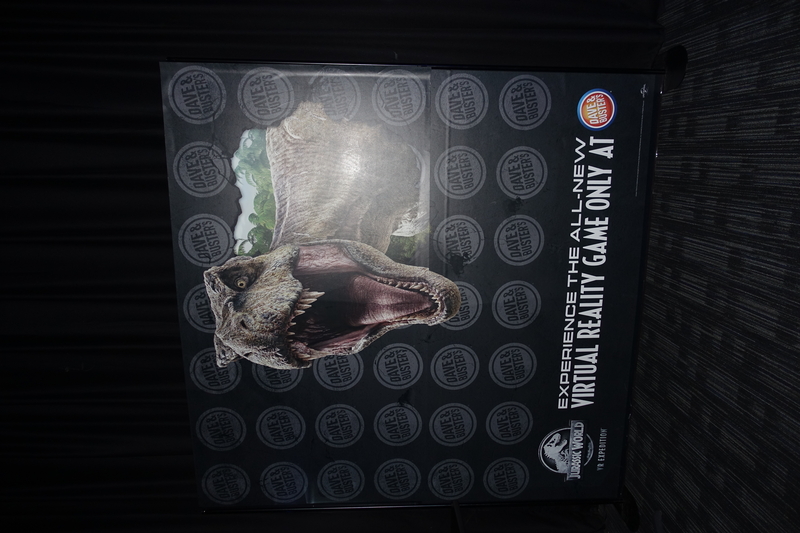 Wondering whether or not you should shell out the cash to play Dave & Busters new Jurassic World VR experience? I recently checked it out at my local Dave & Busters so we can try to answer that question for you. Being interested in VR and motion simulators I was naturally very excited to try out this experience. This is the first chain-wide large scale VR operation based on a large-scale recognizable brand that I know of in the USA. This VR simulation experience is made by VRC, The Virtual Reality Company and you can find a link to their website right here. I played the attraction at the Cheektowaga, NY Dave & Busters in the Walden Galleria Mall. 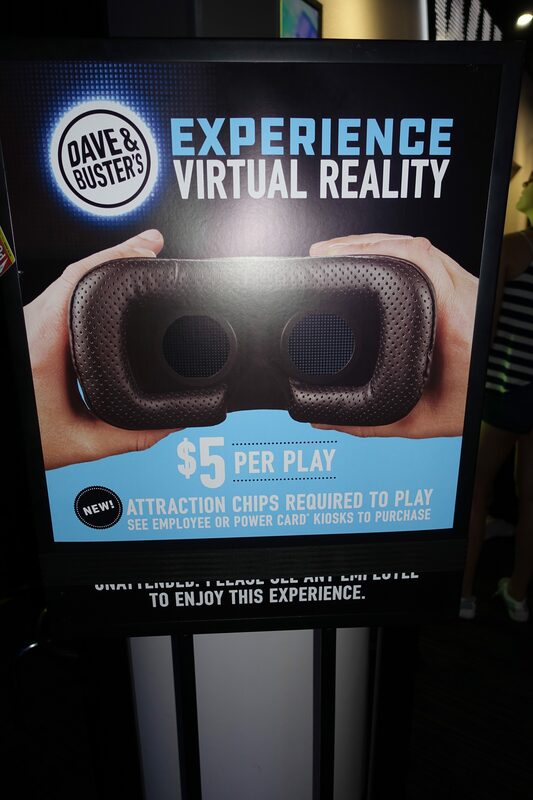 The experience costs $5 to play, you have to purchase an attraction credit to play it which is separate from the game chips you use to play all the other games at Dave & Busters so you cannot use chips to play this attraction. Attraction credits are purchased at the kiosk or from the same place you recharge or purchase your power cards. Once you purchase your credits you stand in line for the attraction. This attraction requires a separate employee to run. There was a steady stream of guests at this attraction at my location but it was not so much that I had to wait in a long line to play it. I only had to wait one turn to play. The attraction is a 4 seat motion simulator that moves in all directions (it doesn’t go upside down or anything crazy like that) with a small staircase that the employee has to pull down for guests to get in and out of the ride. 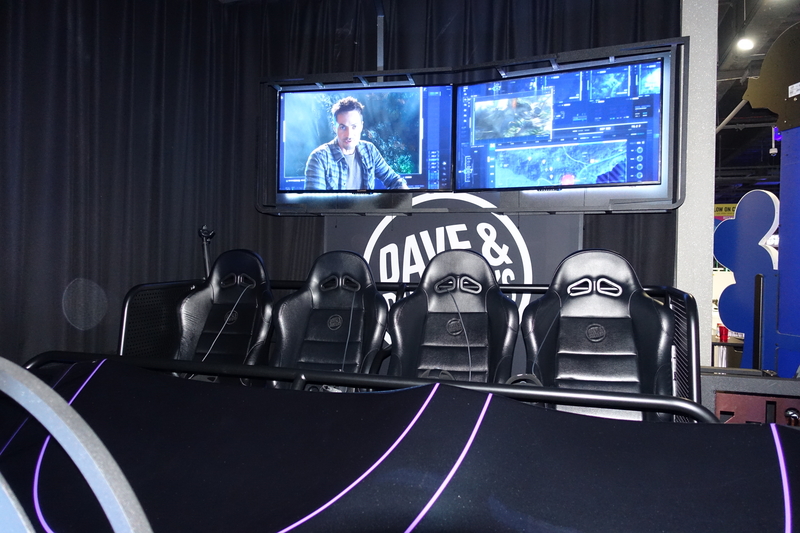 It has 2 screens where onlookers can view the action, but the screens show a blank image once the game actually starts for the players inside the simulator. Once you sit down there is a single lap belt to buckle. The headsets used are a HTC Vive. There is a single controller that is held in one hand with 2 buttons on it. Its probably a good idea to buckle the seatbelt and put the controller on your lap before you put on the headset so you are not fumbling around looking for the controller like I was; this way you can grab the controller easily after you put on the headset. Once you put the headset on you will see instructions on how to adjust it which is very easy as it adjusts with a single knob. It is possible to put the headset on over glasses but your experience may vary depending on the type of glasses you have. Once everyone is strapped in the ride will start. Without giving too much away on this attraction, the object of the game is to scan dinosaurs with a handheld scanner as you run through the Jurassic Park World (please note there is no actual running as you are sitting in a motion simulator). The handheld scanner is the one controller in your hand and it will light up as a bright white object in the game world. Depending on how many others you are playing with you may see the other scanners in the game as well. The game will keep track of how many dinosaurs you tag with the object being to tag as many as possible. There are no battles and no bullets so there is no real shooting in this game. Even if you do not tag a lot of dinosaurs it does not detract from the experience at all. I personally managed to tag 27 dinosaurs. It is fun to play with 4 riders in the simulator. Now we will answer the most important question, is this experience worth the extra $5 to play? Yes it is. I can definitely say it is worth the money, and everyone should try it out if you have the opportunity. If you have to make a special trip to a further location to play it, its still probably worth your time and money, just call ahead to make sure the game is in working order before you travel a long distance to play it. The graphics, game and experience is very well done, and feels like one of the large theme park attractions at Disney or another large theme park. The graphics are just amazing. The motion base looks intense when you are watching the ride but while you are in it, it feels very smooth and matches the action in the game perfectly, the motion is not too intense and it does not hurt. I did not feel sick on the ride at all. I did not notice any technical glitches and the simulator seemed to be in perfect working order. When you are done with the ride you can take a picture in front of the backdrop. If you have had a chance to play it, do you agree or disagree with my review above? I don’t entirely see the point in amusement VR yet. All the games are glorified Typhoon motion simulators. Until we see a true rail shooter (instead of a five-minute timed thrill-ride), I don’t have any reason to play this stuff. Now Omni Arena, on the other hand…that’s something I could get behind.